Printer Drums – What are they banging on about? First, the data for a page is sent to the printer. Then, a sheet of paper is drawn into the printer by rollers. The sheet passes over a wire or some electrically charged rollers. This gives the sheet a slight negative charge. A laser then draws an image into the static electricity created on the drum, matching the instructions in the data, this alters the charge in these areas on the drum. 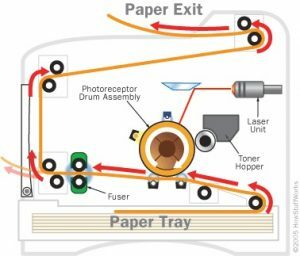 Toner then sticks to the drum wherever the laser has touched it. When the paper makes contact with the drum, the paper’s lower charge pulls the toner from the drum in the required pattern. The paper is then heated when it passes through another set of rollers, this melts the toner to the paper. After printing a page, a drum has both toner residue and electrical residue clinging to it. Both must be removed before printing each page. First, rubber scrapers remove toner residue. Next, the primary drum rotates over a smaller charged drum to neutralize any electrostatic still clinging to it. The drum is now ready for the next page. A lot of laser printers, use a toner cartridge that includes a drum. Less consumables for your machine is a good thing, but drums can tend to outlast toners. While replacing your drum every time you replace your toner will guarantee the best print quality, the units have two drawbacks: they are more expensive and bigger than their counterparts. Some printers also use a separate drum and toner cartridge. This allows you to change toners when they run out and keep reusing the drum until the end of its life, which can typically be 4-6 toners life. Many color laser printers have separate drums too which believe it or not helps to reduce the size of the printer overall.